Where there’s smoke, there’s fire. Where there’s Smokey, there’s a quiet storm. Smokey Robinson & the Miracles set off five-alarm blazes around the world during their fifteen years together from 1957 to 1972, while he also wrote and produced a multitude of hits for the group and many others associated with Motown Records, including Mary Wells, the Temptations and Marvin Gaye. When Smokey split from the Miracles, he wanted tranquillity: to spend time with spouse Claudette (who was in the group, but retired from the road in 1964) and to sustain a family life. “This is it, guys,” he told his soulmates in ’71, recalled in his autobiography, In My Life. “I don’t want my kids not knowing they have a father. I don’t want to come home and have them asking me for my autograph.” “Smokey happened to be with me [when I received my first producer’s royalty cheque]. I couldn’t wait to tear open the envelope. When I did, we saw a cheque for $3.19! ‘You may as well start your own record label,’ Smokey said.” Berry Gordy Jr. This was a parent so dedicated to Motown Records, by the way, that he called his son Berry and, for good measure, added Borope as a middle monicker – after the first two letters of the Miracles’ names: Bobby Rodgers, Ronnie White and Pete Moore. Smokey’s daughter? He dubbed her Tamla Claudette. 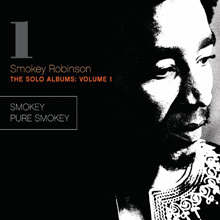 The firestarter returned in 1973 with his solo debut, Smokey, perhaps most memorable for the socially-conscious lyrics of ‘Just My Soul Responding,’ which also featured an authentic Sioux chant by Tom Bee, part of the American Indian group XIT, under contract to Motown’s rock imprint, Rare Earth. At the same time, Smokey continued to write and produce for others – such as a brace of hits for the Supremes, ‘Floy Joy’ and ‘Automatically Sunshine’ – while seeing his catalogue consistently draw attention. Such covers during the early 1970s ranged from the southern soul of Eddie Floyd’s ‘My Girl’ and the Staple Singers’ ‘You’ve Got To Earn It’ to the middle-of-the-road pop of Petula Clark’s ‘My Guy’ and a country take on that same song, by Lynda K. Lance. 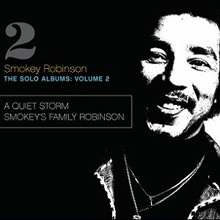 After a second solo turn, Pure Smokey, the singer/songwriter found a concept for his third album: “soft winds – warm breeze – a power source – a tender force – quiet storm – blowing through my life.” Robinson was determined to deliver on that promise. The result was 1975’s A Quiet Storm, his most popular solo project to that point, a Top Ten R&B success which also breezed around the US pop charts for the best part of a year. 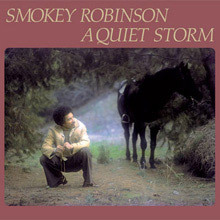 A Quiet Storm is notable for at least three other reasons: ‘Happy (Love Theme From “Lady Sings The Blues”),’ a collaboration with film score composer Michel Legrand; ‘Wedding Song,’ originally crafted for the ’73 marriage of Jermaine Jackson to Berry Gordy’s daughter, Hazel Joy; and ‘Baby That’s Backatcha,” the perfect embodiment of the entire album’s subtle mood. What’s more, the last of these songs was the first No. 1 of his solo career. remained his best-selling LP until 1979’s Where There’s Smoke blew into town. In between, Robinson burned up a lot of energy and expense on Big Time, a “blaxploitation” film for which he was executive producer, as well as an animated movie, Bush Head. 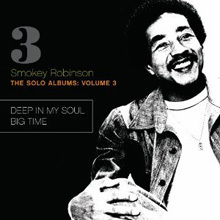 Fortunately, there were also several mellifluous albums: Smokey’s Family Robinson, Deep In My Soul, Love Breeze and the very first live set of his solo years, Smokin’. That set was recorded at West Hollywood’s Roxy nightspot in the spring of ’78, and found him returning to Miracles material with gusto (‘Bad Girl,’ ‘Mickey’s Monkey,’ ‘The Tears Of A Clown’) as well as with melancholy (‘The Tracks Of My Tears,’ ‘Ooo Baby Baby’). 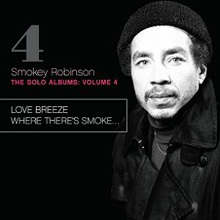 The following year, Smokey returned to the righteous upper ranks of the charts with ‘Cruisin’,’ the centrepiece of Where There’s Smoke, and in 1981, ‘Being With You,’ the main attraction of the album of the same name. The track for ‘Cruisin’ ‘ was shaped by his longtime guitarist, Marv Tarplin, before the lyric sparked to life. And when Smokey was reminded of the Temptations‘ 1971 milestone, ‘Just My Imagination (Running Away With Me),’ he knew he had the rightsoundfor the new song, too. ‘Cruisin’ ‘ soared to sales heights which Smokey had not experienced since ‘Baby That’s Backatcha.’ More pleasure was to come thanks to the woman with ‘Bette Davis Eyes,’ Kim Carnes. If she and her record producer, George Tobin, hadn’t fallen out, Kim might have cut ‘Being With You’ instead of Smokey. 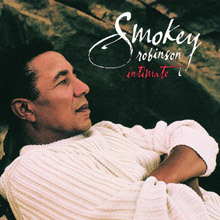 Within a few weeks of its 1981 release, ‘Being With You’ reacted at R&B and pop radio, and Smokey secured the single biggest hit of his solo career. Its statistics included a No. 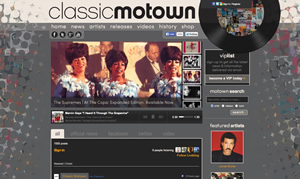 1 triumph in the UK, where eleven years earlier, a local Motown employee had suggested an old Miracles LP track called ‘The Tears Of A Clown’ as a new potential single release.Â That one burned the house down, too. The following years yielded plenty of Smoke and fire. 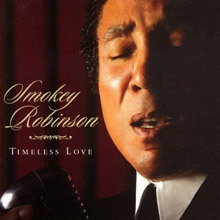 ‘Just To See Her’ and ‘One Heartbeat’ were back-to-back Top Ten crossover hits for the singer in the late 1980s, drawn from One Heartbeat, and ‘Everything You Touch’ caressed the R&B Top Five in 1990, extracted from that year’s Love, Smokey. 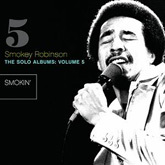 By then, Smokey’s songs were burned into popular music’s DNA, with new interpretations by everyone from the Rolling Stones to Tammy Wynette, from Elvis Costello to D’Angelo, from UB40 to Jerry Garcia. 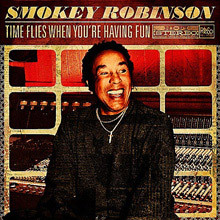 To this day, William “Smokey” Robinson is combustible. His extraordinary body of work has earned him the right to do pretty much anything he wants and that’s what he has done. Make an album (2006’s Timeless Love) of standards which he admired as a youngster? Check. Tweet for 67,000+ followers, and front an official Facebook page with 114,000+ “likes”? Check. Of course, Smokey’s music is also front and centre in the new Broadway smash, Motown: The Musical, from ‘My Guy’ to ‘My Girl’ and more. Look, the titles of those two songs are even emblazoned on a key ring available at the merchandise stand in the lobby! And the young actor/singer who plays Smokey in the show, Charl Brown, perfectly captured the Robinson persona – so much so that his performance was nominated for a Tony award.